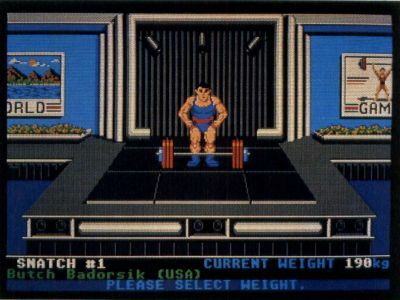 In World Games, Epyx takes you on a tour of the sporting world. From Tokyo to the Soviet Union to the American Midwest, you compete in events representing the country you visit. There are a total of eight sporting events to compete in. 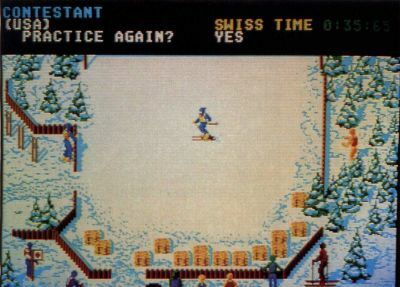 As in Summer Games and Winter Games, previously released by Epyx, you can choose to compete in all events, some events or one event, practice or seek world records. One unique feature is the travelogue. Each event starts with a brief historical description. (This feature can be turned on or off.) The eight events and the countries they are played in are weight lifting in Russia, barrel jumping in Germany, cliff diving in Mexico, slalom skiing in France, logrolling in Canada, bull riding in the United States, caber tossing in Scotland and sumo wrestling in Japan. At the start of the game you choose the country you want to represent, the number of players (up to eight) and the number of joysticks. The keyboard can also be used to control moves. The events in World Games vary in interest and playability. I liked the cliff diving, barrel jumping, weight lifting and sumo wrestling. For the cliff-diving competition you travel to Acapulco. You stand on the edge of a rocky cliff and attempt to dive into the rock-strewn water below. The higher the dive, the higher your score—if you complete it successfully. As you dive, you arch your back to sail away from the cliff face, straightening out just before you enter the water. Waves roll in and out, changing the depth of the water. You have to time your dive with the waves. The comic actions of a pelican sitting on a nearby rock help judge your dive. 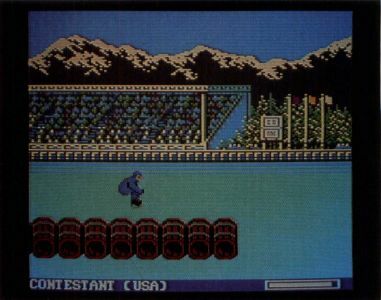 Barrel jumping is like many other events in Epyx's sports games. You move your skater's legs to gain speed, then hurl him into the air to clear the barrels. This is a simple but addictive event. You choose what number of barrels you want to attempt to jump, then go for it. Sumo wrestling will appeal to dedicated fans of modern wrestling. You control one of two giant wrestlers. Your goal is to force the other wrestler out of the ring or throw him to the ground. Two players can wrestle head-to-head. If there is no clear winner, the player with the best moves wins. The other events are the caber tossing, bull riding, logrolling and slalom skiing. In the caber toss you must carry what looks like a small telephone pole a number of feet to gain momentum, then toss it. If you don't toss the pole soon enough, it falls on your toes. I found moving my player's feet difficult, as if they were stuck in cement. Caber tossing takes a lot of practice, I guess, though I question whether it is really worth the effort. Logrolling was a little better. You start out standing on a log with a lumberjack. You roll it forward and backward to try to make him fall into the water. I usually wind up in the water with a shark's fin circling me. (The animation in these games really adds to the fun.) Sometimes, though, Jacques (as I named him) takes a dunking. Logrolling still isn't as exciting as some of the other events. Bull riding is more of a challenge. You are placed on a wildly bucking, spinning bull and must somehow hang on. There are several different bulls to ride, each harder than the one before. 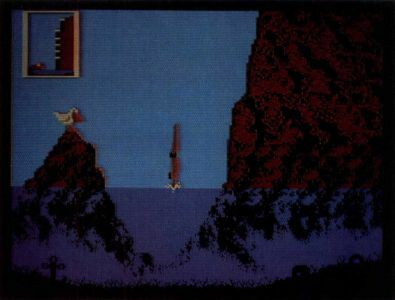 In practice mode, one player can control the bull and try to dump the other guy off. Dumping someone else is as much fun as the main event. Slalom skiing is a good event, though it is very difficult to master. You ski downhill, making turns through flagged gates. A missed gate costs you a five-second penalty. Run into a gate and you fall, ending your run. I had trouble getting the hang of turning for gates. I either turned too fast and slowed to a stop or didn't turn fast enough and missed the gate. I also crashed into lots of gates. The scrolling landscape you see as you move downhill gives the game an alpine flavor. The fastest skier to actually complete the course is the winner. World Games has a variety of well-executed events filled with entertaining graphics and animation. Even if a couple of the events are mediocre. World Games is still a surefire winner.